Tankers Get Ready for Cataclysm! You are here: Home / Tanking / Tankers Get Ready for Cataclysm! From Deepholm, an ancient evil arises to pose a new threat to Azeroth and Kalimdor. As the battle rages on with the Undead Scourge, the world has undergone drastic changes signaling the rise of another epic adventure. World of Warcraft: Cataclysm, the 3rd installment of the highly popular MMORPG has taken the franchise into another dimension of Blizzard awesomeness. New races, new race-class combinations, new zones, instances, battlegrounds and raids,and an all new level cap of 85. It will be a completely different game than you’ve ever experienced in Northrend. There have been several revamps in content that we’ve become attuned to in Wrath of the Lich King, and our Mr. and Ms. Popular in raids and groups, the Tanks, will have to get used to a whole new system that will challenge the tanks in adjusting their rotations and strategies in the game. Check it out tankers, here’s a sweet short glimpse of what’s in store for you in Cataclysm. The Stats system has changed, rechanged, and changed again. This time statsare focused to what Blizzard likes to call “core” stats which simplifies and amplifies each statistic. Don’t worry though because some are not completely removed, they’ve just been incorporated into the main stats and removed from gears so that players can have an easier and less strenuous time gearing up. Tanks should primarily concern themselves with the removal of Defense Rating and Armor Penetration Rating as they’ll be replaced by stats coming from the Talent tree. In the absence of those, Stamina has been increased in gears. Our classis tanks, the Warrior class, have undergone several revamps in Cata. The most notable is the mitigation and management of Rage. Warriors now have “Rage Normalization”, a new system introduced to standardize the Rage accumulation and consumption. Rage doesn’t rely anymore on the amount of damage dealt or received but instead will be based on the health the Warrior has. This is an attempt to solve the issue of Rage management and Rage starvation in battles. Various attacks have also changed their Rage cost in exchange for higher damage or higher threat like Heroic Strike and Maul. While Shouts such as Battle Shout, Commanding Shout, and Demoralizing Shout will have no more Rage cost. These changes may leave a Warrior dumbfounded once Cataclysm hits our hard drives as strategies and rotations may differ from what they’ve been used to. But hey, gaming’s boring if we things over and over, right? Our fuzzy-bear Feral druids will undergo a similar change as that of the Warrior, as “Rage Normalization” takes into effect. They will also enjoy additional skills beyond level 80 that may help them maintain agro while tanking. One of them is “Thrash” where bear druids deal damage and cause the targets within 10 yards to bleed. This additional skill allows our ADHD druid tanks to have another button to press during an encounter. Our light-binding Paladin tanks will be more than happy with their additional skill, “Guardian of Ancient Kings”. The skill summons a guardian (duh) that either heals a target (for Holy specced Pallys) or absorbs all damage (for Protection Pallys) in a period of time. The Protection spec will be buffed up for a more tank-focused tree, where Paladins under the tree will have improved and focused defenses and threat generators that will help maintain agro. 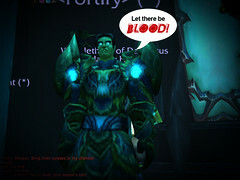 Finally, our tanks with a lost identity, the Death Knights, will be having Blood as a dedicated tank tree leaving Frost and Unholy more room to grow in DPS. Runes will now generate faster by sets of 2 instead of one at a time making skill rotation faster. Additional skill that can be helpful in surviving as tanks is “Necrotic Strike”, a skill that allows the Death Knight to deal and absorb damage to and from the enemy. Cataclysm is a whole new game for tanks, and if you’re attack pattern works in Wrath of the Lich King, don’t expect it to work as well in the 3rd expansion. Tanks are generally regarded as the person that can screw up or make up the battle at the beginning of an encounter. So better read up and stay updated as we approach Cata’s arrival so that us DPS and Healers won’t get pissed at you.